Yammer connects people and teams across your organization. To be truly productive, team members need to be connected not only to each other but also to the tools they need the most. Last week, with Office 365 Groups integration, we announced that every team working in Yammer now has integrated access to a SharePoint Team site and Document library, a OneNote notebook and Planner for task management. Today, we are connecting teams in Yammer to another core productivity need: the ability to collaborate around Office documents. With today’s announcement, users can now create Office documents such as Word, PowerPoint and Excel and co-author them with their team from within a Yammer group. Additionally, users can easily browse their SharePoint and OneDrive libraries to share files and start discussions with their teams on Yammer. This focus on enabling employees to get work done through deeper integration into the Office 365 suite has led to the fastest annual user growth in Yammer’s history. These new features start rolling out today and will be available to all Yammer users in the coming weeks. Work is more than just conversations. Every day we collaborate with co-workers to create documents in Word, PowerPoint and Excel. 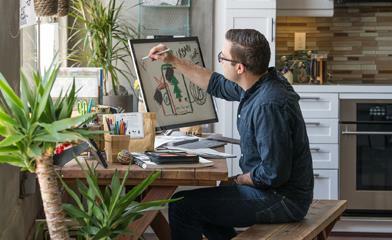 Now, create these Office documents without having to leave Yammer. With the full functionality of Office Online, you can co-author documents with colleagues, view version history and mark important files as official. Because you’re in Yammer, you can also easily share and discuss the document with your team from within your group in Yammer. 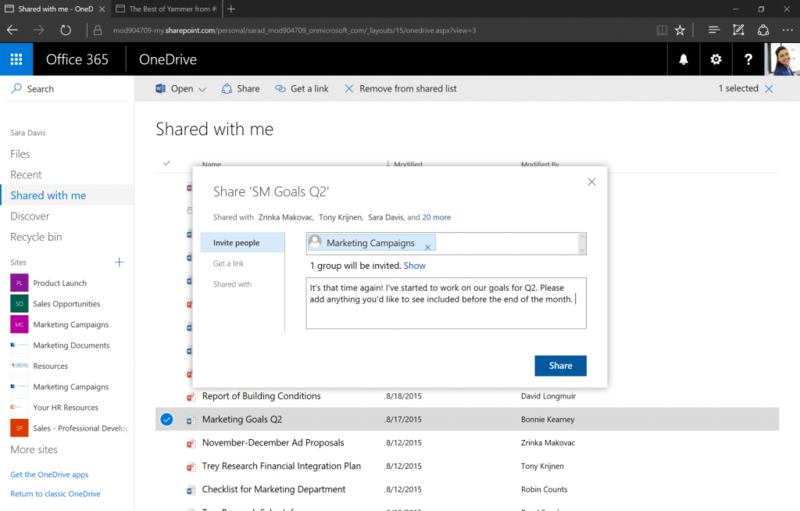 To help teams leverage the power of SharePoint and OneDrive for file storage and management, we made it much easier to share and discuss these files with your team on Yammer. The improved file picker lets you browse and share files from your Office 365 SharePoint Document Libraries or personal OneDrive for Business. This means you can take advantage of SharePoint and OneDrive’s content management capabilities directly from within Yammer. Based on a popular user request, we improved how attachments look inside your network. Whether it’s a link to a website, a file you need feedback on or simply a set of photos—they all now render beautifully right in your Yammer feed. Managing permissions when sharing documents with a group of people can be difficult. One of the big advantages of having Yammer connected to Office 365 Groups is that every Yammer group will exist as an entry in your Global Address List (GAL). This means that you can share and email content from across the whole Office suite directly into your Yammer groups. When a document is shared to a Yammer group, the members of the group are automatically granted access to the document.